Foundations in down slope homes can be a bit more challenging than an up slope home. The foundation system to be used will be influenced by the grade of the slope. It is not unusual to have a combination of different foundation systems on steeper sites. 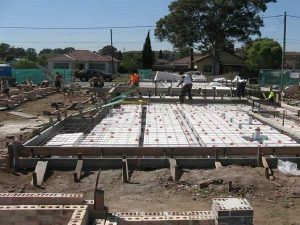 But firstly, some general information to assist you with your knowledge of foundations so you can more thoroughly understand building plans, associated costs and your new home. House foundations are necessary for the safety and stability of your home and to separate wooden building materials from the ground to stop the chance of rotting and termite infestation. There are various options for house foundations and it depends on the slope of the land, the type and size of your home as to what your foundations need to be. We have over 20 years experience building homes and can offer an expert opinion when you tell us the land and house you have in mind for your block in Melbourne. Give us a call on 1300 367 245 and we’ll answer any preliminary questions you may have to give you a good understanding of this part of the building process. What Foundation System do I need for building on a down slope block? Typically the basement will be built on a slab. The foundation system used from the basement to the front of the home can be a slab, but it will usually be a traditional sub floor/joist system which can better accommodate the fall of the site. With a sub floor system there will be stumps or piers under the floor to support the floor. The area between the floor and the ground is air space. This space externally will need to be bricked up (known as the brick footing) with a foundation under that called a strip footing. Strip footings are renown for using a lot of concrete known as bulk which is a cost that many don’t plan for. There are also a lot of bricks that go into a footing. 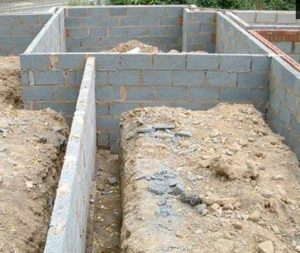 It is not unusual to have footings walls in excess of 1.8m high in places which equates to substantially more bricks than would be used in slab construction. Unlike a slab, a sub floor requires insulation to comply with today’s energy standards. The use of a sub floor will require the insulated floor and wall to be supplemented with double glazed windows to compensate for heat loss through the floor. On a positive note, plumbing, heating and electrical services can run under the floor and not in the ground as they do in slab. With an up slope block there is a greater chance of using a slab foundation. Because the garage is cut under the ground, and essentially placed under the home, a cut and fill approach can also be utilised. Once the garage is built and the retaining walls constructed the ground behind the retaining walls can be back filled and a slab on ground can be formed up to sit on the garage retaining walls. There are many advantages in going with a slab construction. These include speed of construction, strength and energy efficiency. The one disadvantage however, is that slabs on these sites can have complex engineering and cost much more than a standard slab. If the site has cross fall, then a slab may not prove viable. In this case you would design for a traditional footing and joist system. Another option which is quite expensive is a suspended concrete flooring system. This is essentially what is used in high rise buildings whereby the concrete is suspended on form work rather than being placed on the ground. It is not unusual for a particularly difficult site to utilise a combination of the above systems. We recommend you call us and also have a look at our information on inclusions list to understand costs associated with building your new home. In a down slope home your back yard will fall away from your building. This results in a downhill slope. With a gentle slope this can be relatively easy to deal with. However with a moderate or steep grade there is quite a height to deal with from the finished floor of the home to the natural ground level. The easiest way to deal with this is a deck with steps down to natural ground. Alternatively adding a number of tiers to a deck can also be a way dealing with the fall, with each component of the deck acting as a large step. If you want a lawn area then a terraced yard can be used. A combination of both will also work quite well. With a steep grade as you extend out towards the rear you will get higher out of the ground. On a small yard you may have some overlooking issues with neighbours as a standard paling fence will be too low. Use of screening plants may overcome this issue in time. Drainage is not as critical in a down slope yard as water will naturally flow away from the home. However the front yard will require ample drainage as the land will drain to the front of the home. With the home the potential of the living areas being on the 1st floor, there may be some disconnect between kitchen, living and the rear yard. If this is an issue it is best dealt with by your designer in the concept stage. As with an up slope block doing your landscape works can be difficult due to tight access. Building decks requires a lot of building materials. If it can only be manually brought on site, labour charges will be high. If you can afford to, it may be cheaper to have as much of the hard landscape done as part of your build. Your landscaper can then carry out the front and soft landscape works with ease. You may also be interested in designs for a new home.